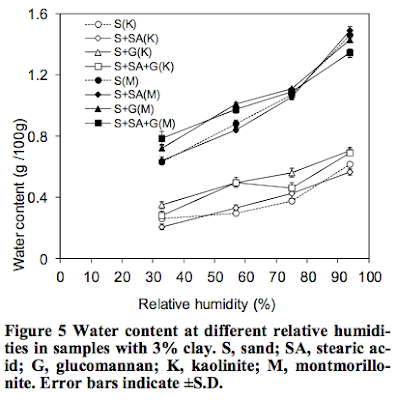 The above is taken from a paper by DAL Leelamanie Changes in Soil Water Content with Ambient Relative Humidity in Relation to the Organic Matter and Clay. It shows measurements of the moisture content of various experimental soil mixtures in equilibrium with air at differing relative humidities. The point of interest to me is not the specifics of which kind of soil retains how much water, but rather that in all cases the soil moisture content is roughly proportional to the relative humidity of the air, and thus that a ballpark 20% change in average relative humidity would be expected to make sizeable impacts on the water content of the soil. Temperature will also play a role. These data were probably collected at a constant temperature. Outside on a sunny day, soil, especially bare soil, can be much warmer than the air. Quoting James Lovelock (The Vanishing Face of Gaia, p. 51) "..at temperatures above about 75 F, rainwater evaporates rapidly enough to leave the land dry between rainstorms.."
Soil moisture is highly dependent on evapotranspiration (ET) the rate of which, in the abscence of plants, is largely governed by ambient air conditions above the soil surface which, one would expect to be roughly some proportional constant given the soil matrix and enviro conditions in the soil and above it. Plants in the system change the whole dynamics though.